If you see all of the falls in Iguazu and still have a few hours to spare, I would recommend taking a walk to the serene Hummingbird Garden. This garden is in the backyard of the cutest and most kind-hearted Argentine woman. She has spent her time and made a career of beautifying her yard and creating a garden that hummingbirds want to return to day in and day out. The hummingbird garden is very well cared for and extremely beautiful. Upon entering, I did not think I would stay for long. However, after sitting on the bench with her for a few minutes, I found myself as captivated as she was. To help us understand the magnificence of what we were looking at, the owner let us look at her books, which contained pictures and descriptions of the sixteen species of hummingbirds present is her garden. As the hummingbirds hovered and landed on the bird feeders filled with sweetened water, she pointed out each bird and told us the name of its species. 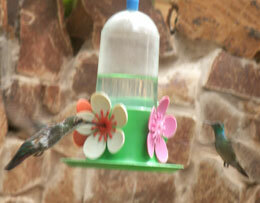 We were able to sit a few feet away from the bird feeders, and if we sat still enough, the hummingbirds came very close. It was a challenging and entertaining task to try to take a picture of the fast moving hummingbirds while on the bird feeders. I busied myself with this challenge for at least 20 minutes! It was an amazing and relaxing environment. What I thought would be a short visit turned out to be a two hour bird watching session. In addition, the adorable owner is very knowledgeable about the birds and loves sharing this knowledge. She only speaks Spanish though, so you might want to practice some bird vocabulary if you want to understand her knowledge. However, with the books, pictures and birds right in front of us, my friends who speak little Spanish got the basic idea of the conversation. In addition to identifying the species, she told us the story of why so many hummingbirds come to her beautiful garden, what she does to keep them coming and what she must do to care for them. For example, her devotion and love for the birds is evident in the fact that she cleans the bird feeders everyday in addition to providing fresh sweetened water. She said this is imperative or the birds can become sick. This got my friends thinking about the water birdfeeders they have at home and the lack of cleaning their feeders receive. Overall, going to the hummingbird garden was an amazing experience. The owner of the garden is incredibly warm and inviting. The $5 peso entrance fee was well worth the experience, the relaxation, the photos and the interaction with the owner. 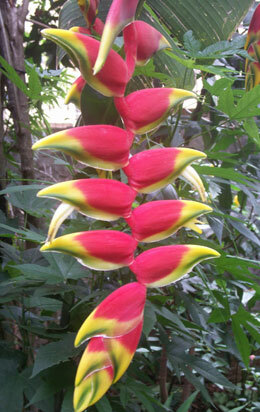 In addition, she sells the books for those of you who want to learn more about the birds and animals of South America. My friends were on their way to climb Aconcagua, so they bought a book to help them identify the birds and animals along the way. They were a great size and could easily fit in your hiking pack! 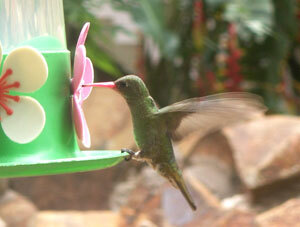 I strongly recommend visiting the hummingbird garden, and you should bring your high zoom camera if you have one! This page rendered in 0.99 seconds.